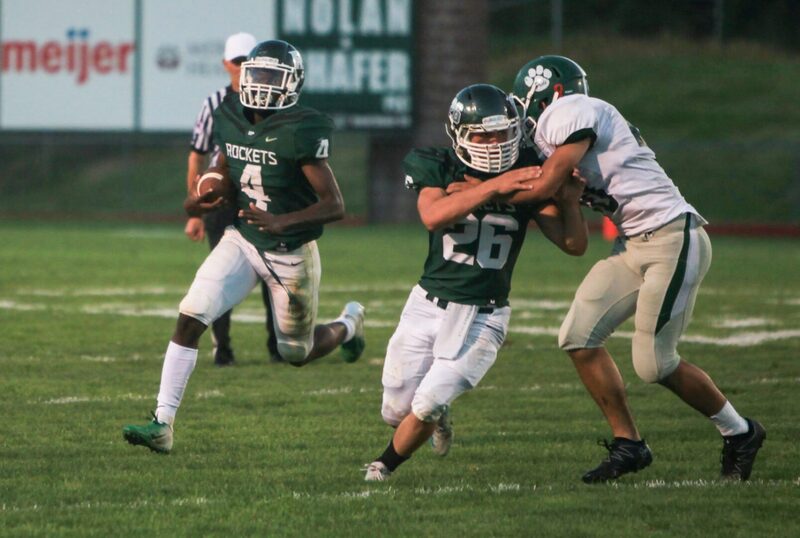 MUSKEGON TOWNSHIP – Eventually the Reeths-Puffer Rockets will find a way to win when the opportunities arise. But Friday night against Jenison was not that time. The Rockets couldn’t take advantage of four Wildcats turnovers or overcome an early deficit in a 44-28 O-K Black Conference loss at home. Reeths-Puffer falls to 0-2 in the conference, and 1-3 overall. Things started off well for the Rockets when Jalen Williams recovered a Wildcats fumble near midfield on the second play of the game, setting up the offense in excellent field position. The Rockets moved the ball to the Jenison 35-yard line, but failed to convert on a 4th-and-5 passing play. The Wildcats took over from there, scoring the games’ next 22 points, starting on the ensuing drive. Jenison’s Raymond Russo scored from 2-yards to give his team a 7-0 lead with 6:04 left in the first quarter. On the first play of the second quarter, Jarel Jackson rolled through the middle of the Rockets defense for a 36-yard TD, and the Wildcats led 14-0. 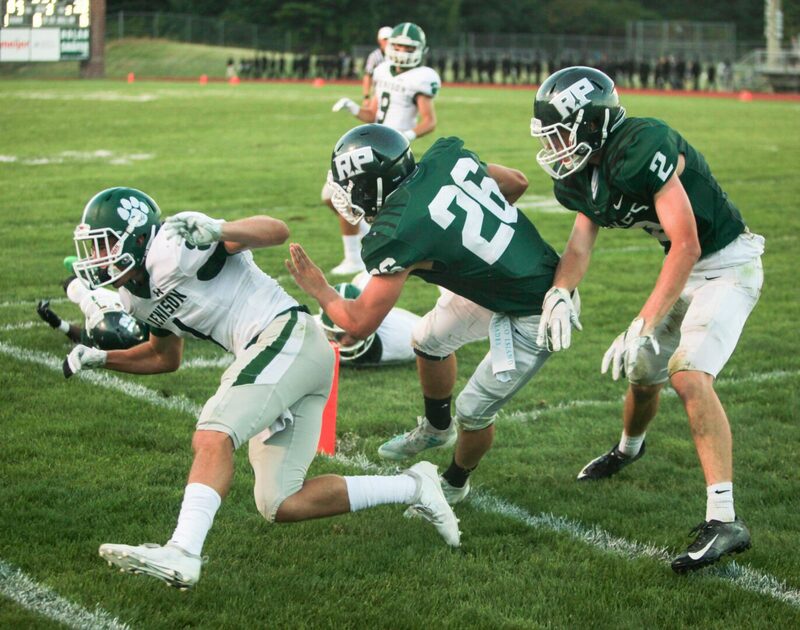 Reeths-Puffer’s next drive ended four plays later at its own 21, when TJ Waters’ punt was blocked by Russo, who fell on the ball in the end zone just 39 seconds into the second quarter. That put Jenison up 22-0. The Rockets responded with a 14-play, 60-yard drive that ended with a six-yard TD run by Brett Buchan, cutting the lead to 22-7 with 5:57 left in the first half. But Jenison quickly responded in the back-and-forth second quarter. Quarterback Kyle Nott scored on the second play of the ensuing drive, running 87 yards to put his team up 29-14 with 5:05 left. The Rockets cut the lead to 29-14 less than two minutes later when quarterback Evan Moskwa scored from one yard out with 3:14 left. It looked as if Puffer caught a break when Jenison’s Brock VanManen’s 86-yard kickoff return was called back due to a holding penalty, but eight plays later, Nott scampered 21 yards to produce a 36-14 Wildcats lead with 22 seconds left in the half. Not to be outdone, the Rockets’ Daven Fox took the first handoff of the ensuing drive 64 yards for a touchdown,, cutting the Jenison lead to 36-21 at the break. Receiving the ball to start the second half, the Rockets had a chance to cut further into the lead, but on 4th-and-1 at midfield, Fox lost eight yards, turning the ball back over to Jenison. Puffer’s defense stopped the next two Wildcat drives, first with a interception at the Rocket 11-yard line by Buchan, then with a fumble recovery, again by Williams, at the Rockets’ 8-yard line. But after the fumble recovery, Reeths-Puffer was unable to move the ball and on fourth-down, the punt snap went over Waters’ head and out of the end zone for a safety. Jenison led 38-21 after three quarters. Jenison started the fourth quarter with a 15-play drive that the Rockets defense stopped on fourth down at the Puffer 4-yard line. The Rockets drove 96 yards and cut the lead to 38-28 on a Moskwa 26-yard TD pass to Carter Fulton with 5:01 left in the game, but failed to cover the ensuing onside kick at the 50. The Wildcats took advantage, scoring on the very next play when Nott rushed around the left end for a 50-yard touchdown with 4:49 left. Reeths-Puffer finished with 369 total yards. Fox led the offense with 101 rushing yards on seven carries. Moskwa added 67 yards on 16 carries and was 14-of-40 passing for 195 yards. Fulton led the receivers with 10 catches for 126 yards.